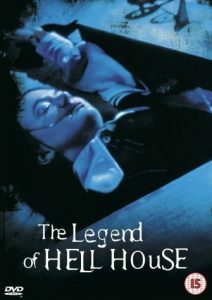 Based on the Richard Matheson novel, Hell House, The Legend of Hell House is a classic haunted house story that knocks the spots off a lot of modern movies. Special effects are minimal but a solid story like this has little need of technical trickery to impress the viewer. Having said that, I suppose it is possible that those viewers who have grown up with a diet of CGI and other special effects may not find the movie to their tastes. It is just a personal opinion, but I sometimes think that these days people are more concerned with the ‘Wow!’ factor than with power of a story. If you were born during the seventies, or before though, the chances are that you will remember the days when the story was the important thing and should be able to appreciate The Legend of Hell House for the great movie it is. At its most basic The Legend of Hell House is the story of what happens when four strangers are thrown together and sent to investigate a haunted house. Clive Revill stars as Dr Lionel Barrett, a physicist and expert in parapsychology, who is hired by dying businessman, Rudolph Deutsch, to find the definitive proof about survival after death; and where better to find that proof than in the most haunted house in the world, The Belasco house, more commonly known as Hell House. Deutsch insists the doctor take two other people with him, both of them mediums. 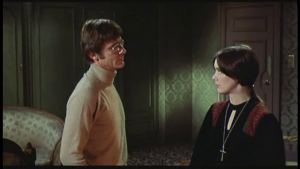 Florence Tanner (Pamela Franklin), who is a mental medium and Benjamin Franklin Fischer (Roddy McDowall), a physical medium and the only survivor of a previous investigation of the house. The fourth member of the group is there by Barrett’s own choice: his wife Ann (Gayle Hunnicutt). The plot of the movie is fairly true to Matheson’s book; a few scenes are missing, but nothing so crucial that it spoils anything. The only major difference I noticed between book and movie is that, in the book, Barrett is a cripple and in the movie he is not. The story work a little better with him as a cripple, but viewers who have never read the book will not notice the difference anyway. My favorite characters in the movie are Fischer and Tanner. I have always been a big fan of Roddy McDowall and he makes a very believable Fisher, who remains quiet and aloof for a lot of the movie. He is still so shell-shocked by his previous visit to Hell House that he has completely closed himself off from the house and has erected a protective psychic barrier. Initially it is the money that has brought Fischer back, but as the investigation progresses he strikes up a friendship with Tanner and eventually comes out of his protective shell and, as his anger towards the house grows; Fischer goes on the attack and becomes the real hero of the movie. The professor remains very much the man of science throughout the movie and is, in his own way, as closed off as Fischer. He is also a man who appears to be more married to his work than to his wife, Ann, who tries to be supportive of his work, but is also a woman with needs of her own. Those needs are not being fulfilled and the house is quick to work on Ann’s sexual frustrations. When the sexual shadow play taking place on the bedroom ceiling proves too much for her, and she turns to the bottle for solace, Ann becomes under the influence of spirits in more ways than one. The house is out to destroy all of its guests and it has a lot of tricks at its disposal. The biggest trick of all is only revealed at the end of the movie and by then it is much too late for some members of the group. One of the things I like about The Legend of Hell House is the creepy feel that is sustained throughout most of the movie, and the choice of soundtrack probably has quite a lot to do with this— the incidental music works a treat and contributes much to the dark and brooding atmosphere. From the moment Barrett and his team arrive at the house, and stand gazing up at it through the fog it is obvious that Hell House is not the sort of place anyone would choose to visit if not for the rather large monetary incentive offered by Deutsch. 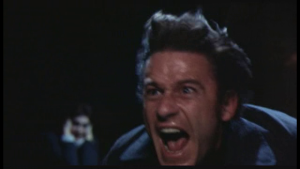 As mentioned earlier in this review, The Legend of Hell House is probably not the best choice for those who are dedicated seekers of the ‘Wow!’; it will, however, always remain somewhere near the top of my own list of favourite horror movies. At the time of this review, the movie not been remade, and if ever it is I am sure that a large injection of CGI Wow! will be included, but the movie is wow enough already and some things are best left as they are.